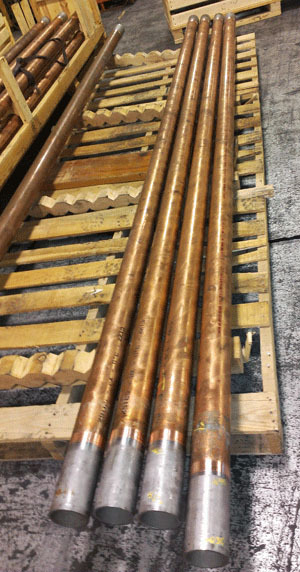 Recently, we received a request to produce a bi-metal pipe configuration created from a bond of copper to stainless steel. This is a fairly exotic combination even for a company like ours that is used to dissimilar metal combinations. When a unique request comes our way, we follow a development process to prove the success. The first step was to verify material chemistry and sizing. In this case, the copper pipe was made from Schedule 40 C12200 alloy in 9’ and 12’ lengths in a 3” diameter. 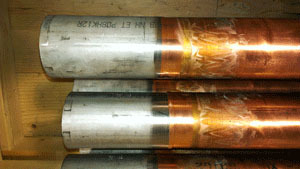 The request was to bond couplers made from Schedule 40 304L stainless steel pipe in 6” lengths to each end of the copper. The client confirmed their acceptance of the weld results shown in the coupons and test pieces, so we moved on to production of the final weldments. 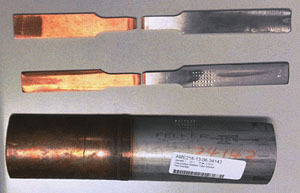 Once the stainless steel couplers were welded to each end of the 9’ and 12’ pipes, the assemblies were run through a lathe to remove the outside and inner weld flash. Into the crates they go! If you would like more information on friction weldable material combinations, take a look at our material combination list. 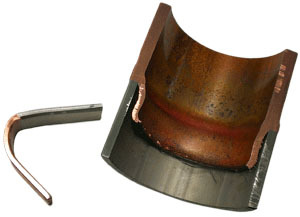 You might also find this resource on The Process of Friction Welding useful. For conversation… What material combinations does your company encounter?